Turns out I’m not so great at sewing by hand. If I didn’t get so frustrated each time I messed up, I’m sure that the learning curve wouldn’t be so huge, but for the most part I just get mad when I make something that doesn’t turn out as I envisioned. It’s the part of me I’ve had since age five and have been trying desperately to grow out of. No such luck. Maybe some day. This week I’ve been working on a shirt for my sister. The boatneck is to “boaty”…? and the sleeves look like wings. If I can fix it I’ll post pictures, but currently I’m taking a break from this monstrosity. I am also discovering there’s no way I’m going get all the intended gifts made for people before Christmas. Looks like Regan and I have some last minute shopping ahead of us this weekend. In the spirit of making things that actually turn out as I envision, I took a break and made these. 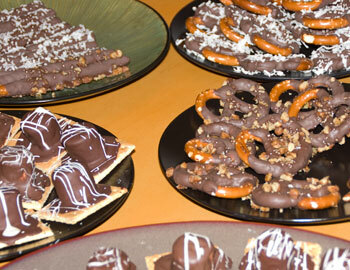 Can’t go wrong with pretzels and chocolate. However, the wrong color settings in a photo can make chocolate and pretzels look as though they’ve gone horribly wrong. Proof below.